We are loving knit headbands. They stay in the hair nicely and don't give the "headband headache". Mostly you can quickly whip one up to match any outfit and do it out of your scraps, and you don't need a sewing machine. 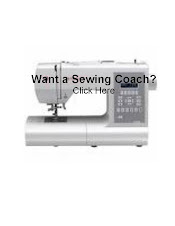 A needle and thread and a glue gun will do the trick. 15" knit Check the fit around the wearer's head. The stretch of knits varies widely. 1. Cut a rectangle 3" by 12" (or there about). 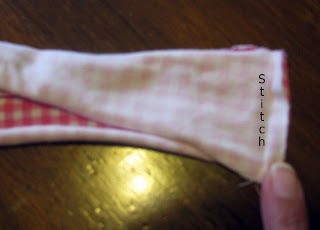 Stitch the short side securely, with right sides together. 2. Gather lace (fabric). 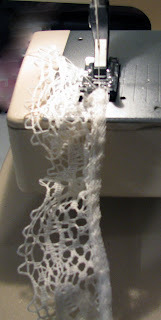 Sew a gathering stitch (longest stitch on your machine) along the edge of the lace. 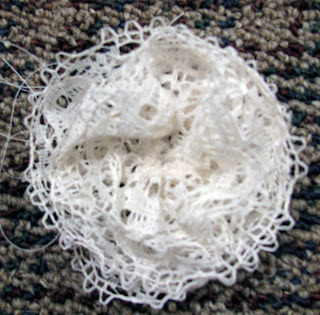 Pull up the thread to make the lace gather as you want it. Don't have a sewing machine....with a needle and thread sew a running stitch. 3. Wind the gathered lace around itself, arranging as you like to create your flower. Stitch or hot glue in place, in the back. 4. Sew (or glue) the flower and button to the headband, slightly off front center with the seam in the middle back. Enjoy your new headband. And, as always share your photos with us in our flickr pool. You'll find it in the left and margin. Oh...someone won the "Follow Me" giveaway. Check the previous post to see if it was you. 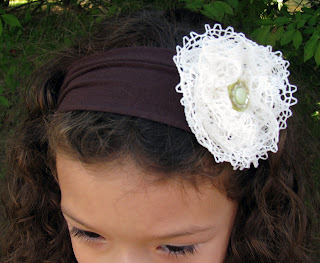 This headband is totally adorable! I was looking for a quick project to make during nap-time and this is so perfect. Thank you for sharing tutorial.